Welcome to Party Blowout. We are stockists and suppliers of balloons and party related products for all types of occasions. We supply balloons to celebrate and adorn every event, including baby showers, baptisms, birthdays, communions, graduations, valentines, christenings, births, hen parties, engagement, wedding, retirement, seasonal as well as commercial and corporate and much more. We have over 700 different varieties of balloons in stock. And even if you cannot find what you are looking for we can supply personalised balloons too. We are proud suppliers of Qualatex latex balloons, considered by many to be the best in the world. We also have a good range of their gumball, bubble and double bubble balloons. We create bouquets and displays of balloons that can be personalised to you or your recipient. All our balloons are made fresh on the day of your event ensuring they looked at their best and will last you as long as possible. We treat our balloons with a patented liquid solution that dries inside latex helium-filled balloons to form a coating that helps hold in the helium making them last up to 25 times longer! For example a 3′ gumball balloon will only last about 24 hours without, whereas with we have seen them last for up to 8 weeks, how about that for value for money. 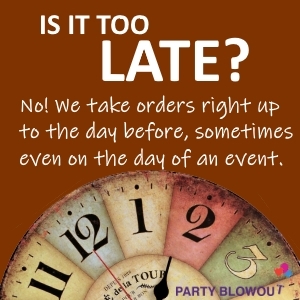 We also deliver 7 days a week, yes we like to party all year round! Our balloon and party shop is open to the public so please come along and visit us, we want to put a smile on your face. We also deliver all over Central Scotland, including Cumbernauld, Airdrie, Coatbridge, Bonnybridge, Kilsyth, Kirkintilloch, Bishopbriggs, Lenzie, Motherwell, Glasgow City Centre, Stirling, Falkirk and further afield! We are proud to announce that we have recently taken the decision to no longer offer balloon releases as a service to our customers. This decision is based upon our environmental policy and the fact that any balloon released into the environment will ultimately result in litter at some point. There are lots of alternatives we can discuss, we offer a fantastic variety of exciting and creative designs and deliveries that we are able to design specifically to your requirements. And once your special occasion is over we ask that our customers remember to PIN IT & BIN IT once finished with your balloons.